'Blue Monday' Sage (upper left) and Ageratum (lower right). Starting plants from seed takes commitment I'm not often ready for. But this year, thanks to my AeroGarden, I have had more success than failure. The Clary sage (Salvia sclarea) was the first thing I started, and it's really taken off. I chose the Salvia sclarea for the plant's value as a cut flower. As the photo shows, it's as close to true, deep blue as a flower can be. And in the floral world, blue is the new black - it goes with everything. Another plant in the blue range is Ageratum 'Blue Horizon', its flowers a fluffy cluster of bright blue. And with its 30" height, it's also a good cut flower. I didn't start the Ageratum from seed; I found it at a local garden center along with some Larkspur Giant Imperial mix. I absolutely love this Larkspur, which is a relative of Delphinium, a somewhat finicky perennial in our hot and humid summers. Next year, I am thinking of starting my own larkspur with seed from Swallowtail Garden Seeds. 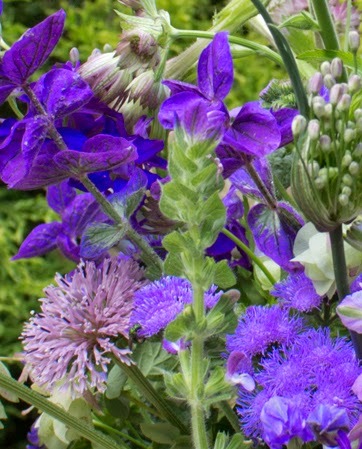 What I'm calling my cutting garden includes larkspur, Ageratum, the clary sage, Campanula, some Echinacea and a Dahlia. 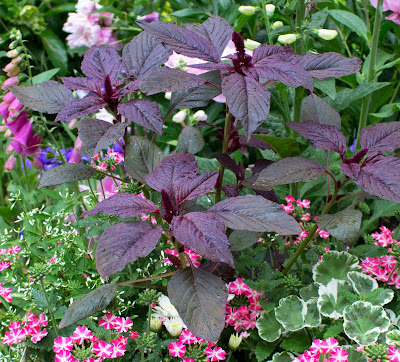 A regularly-pinched Amaranth 'Oeschberg' in a mixed planter. Probably the biggest advantage of starting plants from seed is the varieties you can grow. For instance, I was surprised to find the cutting Ageratum and the larkspur in little cell packs at two separate garden centers. 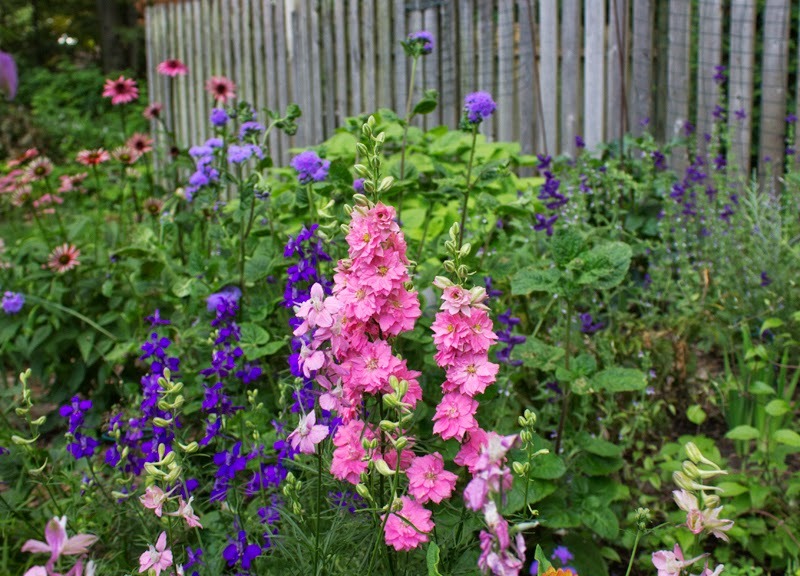 The larkspur is a mix; if I order seed, I can plant individual colors if I want. Another plant I started from seed is a decorative or edible variety of Amaranth called 'Oeschberg'. Described as an upright form of Love Lies Bleeding, this variety is supposedly more compact. I love it in arrangements, especially with orange flowers. 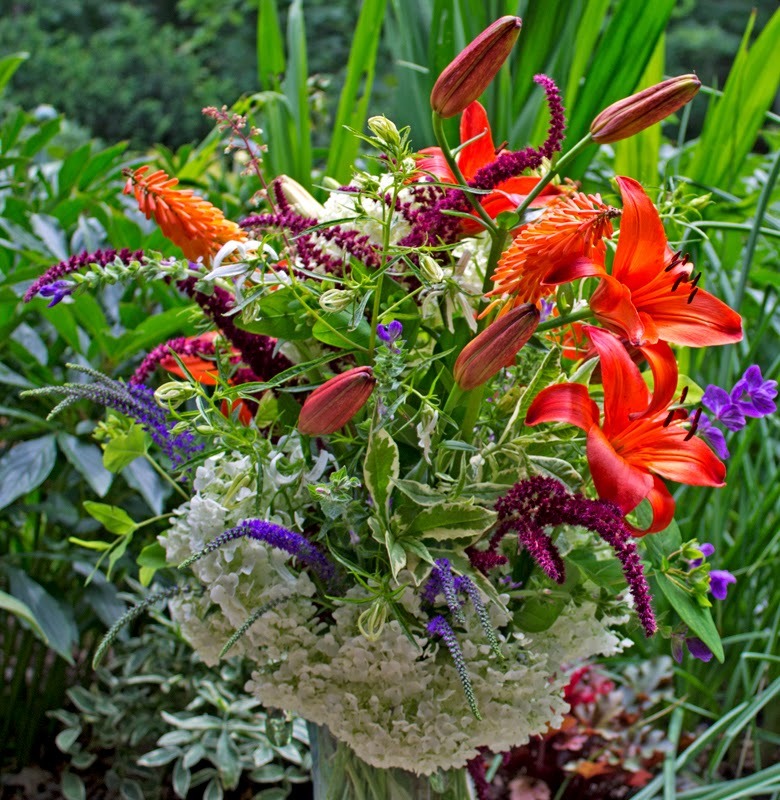 The burgundy spikes of Amaranth 'Oeschberg' add something extra to this arrangement. Always loved the bouquets you brought to work! Lovely. Thanks Patty! With the mosquitoes being so bad I make a mad dash through the garden with my clippers and bring flowers inside to enjoy.